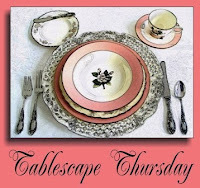 Welcome to the 175th Tablescape Thursday! Early this morning I posted a tour of the downstairs of beautiful Brumby Hall. If you missed that tour, you’ll find it here: Brumby Hall. For Tablescape Thursday, I’m taking you into the dining rooms. Yep, Brumby Hall has two dining rooms, probably due to its function as a special events facility now. This dining area was at the very back of the home. Isn’t the chandelier gorgeous? I loved the simplicity of the three hurricanes down the center of the table. The salad plates depict the Twelve Days of Christmas. This one is “nine ladies dancing.” Does anyone recognize the pattern? Love all the detailed carving on this beautiful sideboard. This room had built in china storage. Toward the front of the home you’ll find a second dining room. Here we see another stunning chandelier. Take a peek at the other beautiful furnishings in this room. You often see these tall mirrors in entrance halls of historic homes. This one was lovely here in the dining room. The room was decorated for Christmas since this tour was in early December. The dining room had its own Christmas tree. If you missed it, you can tour the downstairs of Brumby Hall , HERE and upstairs HERE. 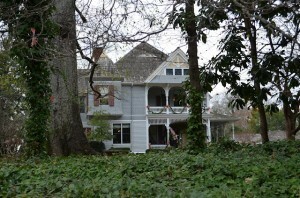 Love historic homes? 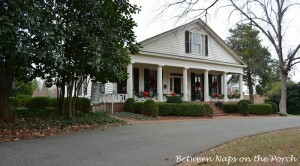 You’ll find more historic home tours, HERE. Looking forward to the beautiful table settings posted for this Tablescape Thursday! Such a beautiful home! Thanks for allowing us to take a peak!! The antiques in this home are absolutely magnificant. What an amazing treat to have the opportunity to see this house. Such a lovely home! Did you notice they didn't get the memo about the bright brass? LOL! They are not running for the cans of ORB, thank goodness! These dining rooms are elegant. WoW! Those chandeliers are breathtaking! I enjoyed the simplicity of the natural pine boughs and berries for the holiday decor, allowing the furniture pieces, themselves be the shining jewels that they are. Thank you for sharing this lovely home tour for our viewing pleasure…and for hoting this weekly meme! Hope you had a Wonderful Christmas hon. Thanks for the home tour, they are always fun. 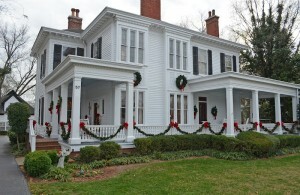 Very pretty historic home as always, loved the beautiful yet simple decorations. Thanks for being a blessing to all of us by hosting Tablescape Thursday. Hope you have a Wonderful New Year…. Love the symmetry and simplicity of the centerpieces! How beautiful! What a gorgeous home! Happy New Year, Susan! Thank you for a wonderful year of posts that have educated me and inspired me! God bless! Love the chandelier and the built in corner cabinets – and of course that fabulous dining room tree! Stunning tablescapes, I specially love the first one, it's fabulous! The dining room is amazing. I also did a tablescape with hurricanes for my New Year's Eve tablescape for Tbscape Thursday, so thank you dear Susan for having me this last Thursday and the entire year 2011 and for all you've shared with us. Have a terrific New Year 2012. A l'aube de cette année 2012, je vous renouvelle mes voeux afin que tout soit possible y compris le bonheur. Absolutely stunning. I very much like the way it has been decorated for Christmas, very understated, and yet it has a big impact. Thank you for sharing, I do enjoy seeing these historic homes. Such an elegant home, love the chandelier i the dining room. Beautifully done. I really love the simple but festive decorating style featured in this home. 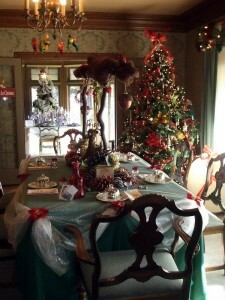 The dining table is perfection, and the 12 Days of Christmas dishes add a touch of whimsy! Pure elegance! You have a special gift of making everything look gorgeous! Hi Susan! Her home is so beautiful! Thanks for hosting! I'm a little late, but I'm here! Happy New Year Susan to you and all the other fabulous tablescapers! Thank you for hosting this every Thursday. beautifully decorated mansion, thanks for the tour! I am drooling over the beautiful furniture pieces in an equally beautiful home!!! I especially love the intricate carved details on the sideboard in the dining room at the back of the house. I am in awe! I really loved both of these posts. Great pics! Brumby Hall looks like a beautiful place. Thanks for sharing these pictures with us!